Today’s recipe came from what is essentially an encyclopaedia of American food, USA by Sheila Lukins. Now, I’m not what rappers would call a hater normally, but this Sheila had the task of travelling around every state and eating loads of delicious American dishes. So this woman gets to eat pancakes, waffles, burgers, steaks, sandwiches, ribs, fried chicken, lobster, pies, ice cream, milkshakes…. Phew, I think you get the point. And she gets to eat this for work. Just think of that when your alarms going off tomorrow morning, and you’ll realise why it’s easy to hate on this woman. In all seriousness though, if my job was to travel, eat and then write about it I’d be pretty darn happy, so fair play to her. If it makes you feel any better, she must be either really overweight or spends a huge amount of time at the gym. Every silver lining has a cloud! I seem to have amassed quite a few cookbooks centred around the States, I just love the food I eat when on holiday over there, and there is so much variation due to the sheer size of the place. It’s wrong to pigeonhole all American food as junk, although you’d be an idiot to not realise the amount of junk food there is there. 52 states, climates ranging from tropical to the tundra, swathes of the country covered by farmland (the cynical might say to keep McDonald’s in burgers and fries) and you’ve got a country that can produce a huge and varied amount of ingredients. And all I can say about the service over there is that it puts the UK’s service industry to shame. I sadly don’t have the budget for a trip around America to satisfy my hungry palette, so cooking from this book will have to suffice until I have made my millions. I had really wanted to cook the recipe Apple Puff Pancakes from USA this morning to aid my hangover recovery, but soon found I didn’t have any ground cinnamon, and if I can’t do it right then I won’t do it. So I had to make do with regular pancakes smothered in syrup, poor me. In the end I made myself dinner with the recipe Beaufort Shrimp Burgers, which the author first tasted in South Carolina, which is supposed to be a beautiful part of the country, lucky cow. The recipe was intended for 6 people so I tried to round it down as best as I could to make enough for 2, which I couldn’t quite pull off. Miscalculated how much mayo to add to the chunks of prawn so I ended up with burgers that were a little too runny and couldn’t quite hold their shape in the frying pan (or skillet as the Americans call it, which I think is a much better word if you happen to sing made up ditties while cooking. Not that I do,cough). Not that this mattered too much, the burgers tasted good and because it was made up of shellfish and not minced beef it didn’t feel heavy, greasy or unhealthy. The recipe advises spreading the rolls with tartare sauce which I did but I felt this overpowered the delicate taste of prawns, as without the sauce the burger tasted a lot more fresh and vibrant. Its definitely not your run of the mill burger, but sometimes it’s nice to make a change and try something different. Would I make it again? Not sure, it’s nothing spectacular, and while it’s nice to have a change, no burger can ever top the mighty beef. Not bad for the first recipe I’ve cooked from this book. The book is over 600 pages long, so plenty more recipes for me to sink my teeth into, both figuratively and literally. Bring it on! Trying to lose weight when your a bit of a foodie is officially a bloody nightmare. And when you’re supposed to be writing a blog about unusual and/or delicious foods, you come unstuck. All the things I want to cook from my poor neglected cookbooks contain pretty much all the things that need to be avoided: butter, cheese, cream, chocolate, saturated fat, cholesterol… Damn that saturated fat tastes good. So I’ve been very healthy this week cooking boring healthy foods and doing boring healthy exercise, and now all I can think about is the complete opposite. All I can say is bring on the weekend, when I don’t have to even pretend to be good. After 5 pm on a Friday, there are no rules. With all of the above in mind, and rather than boring you senseless with what I actually ate, here’s what I wish I could have eaten for dinner this week. Monday: A gigantic slice of chocolate cake. If this wouldn’t make you excited to see Monday arrive, then you must be dead inside. That’s all. Tuesday: Homemade burgers with loads of cheese and bacon. While any food that when squeezed oozes out grease can’t possibly be healthy, you know for sure that it’s going to taste good. Add melted cheese, crisp bacon and crunchy gherkins and you’re in heaven. Wednesday: Lasagne. Oh how I love lasagne. 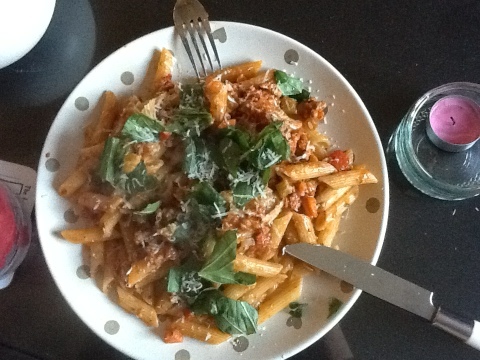 What’s not to love- rich meaty tomato sauce, smooth, creamy, bland white sauce (bland is good! 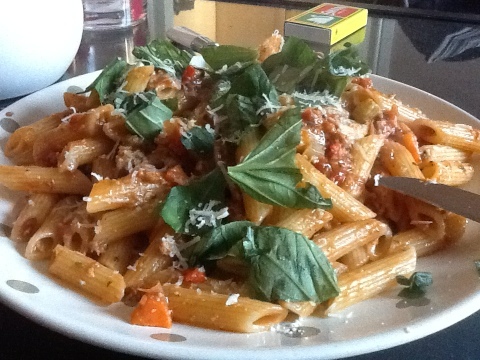 ), silky sheets of pasta, and a lot of strong melted cheese, with the cheesy edges gone all crunchy. Lasagne and I should really get a room. Thursday: Thai green curry. When done right, this is so good. But it’s full of calorie laden coconut milk so not diet food. If you’re going to eat it, do it right: either make it from scratch, paste and all, or go to a good Thai restaurant. Spice and flavour paradise! Friday: Nandos piri piri chicken, followed by chocolate fudge cake and clotted cream. Oh wait, that is what I’m having tomorrow. Thank goodness! Sorry if any of you working on your summer body now want to roll around in a vat of chocolate cake. Just hold out until the weekend! Yes I’m back. I’m sorry to say that you can’t get rid of me that easily. The Boyfriend works away a lot and cooking then writing about it is what keeps me from long distance relationship insanity! 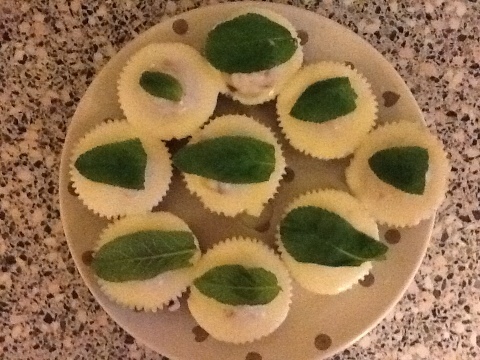 So now he’s gone again its back to trying out new recipes and taking risks in the kitchen. And lucky for you, he’s gone for flipping ages so I’ll be blogging like no ones ever blogged before! Yesterday for The Boyfriends last day at home for 4 long months, we rustled up a pretty scrummy roast lamb dinner. The trouble is, The Boyfriend, god love him, can’t just get a modestly sized lamb joint for the two of us, oh no. 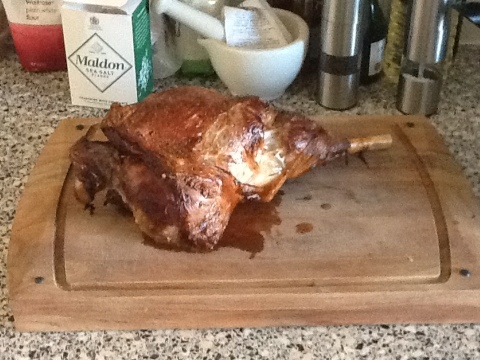 Instead, we ended up with an entire leg of lamb that could have easily fed 10 people. I should never let him into a supermarket without a chaperone. Sweetly, he did suggest he brought it so I could use the masses of leftover meat for dinners throughout the week, which would sound lovely if he didn’t know I don’t really like lamb all that much. Me thinks someone just wanted to pig out on lamb. So what did I do today with some of the leftovers? Naturally I turned to the queen of leftovers, Nigella, and knocked up an Anglo-Asian lamb salad straight from the pages of Express. I’m finding myself more and more drawn to salads these days after a couple of very successful ones which regular readers may remember. I have some weight to lose for the summer so to enjoy healthy low fat food is now a complete and utter blessing. This fusion salad incorporates the Britishness of roast lamb and red currant jelly with the spiky flavours of Asia and while nothing ground breaking, is pretty damn tasty. The dressing is sharp, sour and spicy and includes chilli, spring onion, soy sauce, red currant jelly and rice vinegar. Coat the lamb in the dressing then toss through a plate of salad leaves. 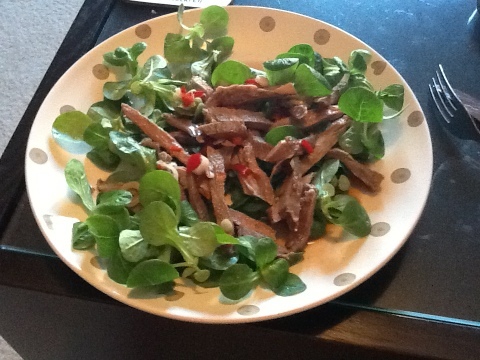 Rather poetically, I went for lambs lettuce as my salad of choice and I suggest you do to. You don’t want a leaf with a strong flavour as the dressing packs quite a punch. Nigella cooks lamb steaks fresh for this salad, but leftover roast lamb also works, making this a super speedy dinner after a long day at work and an excruciating legs,bums and tums class! Now all I need to do us work out what else I can use that lamb for. 3 servings down, only 7 to go! Well I’m back on the cookbook scene today after going AWOL for a bit, and today’s recipe was from my shiny new cookbook ‘Supper Club’ by Kerstin Rodgers. Finally using it after weeks of it floating around the living room just waiting to be put to work in the kitchen. There are lots of really intriguing sounding recipes in this cookbook and because she runs an underground restaurant they are also at times unique and sometimes downright disturbing. 7up salad anyone? In her defence, she puts that salad in a themed menu which is apparently an accurate summary of the food Elvis ate in his final few days. So if you don’t want to die on the toilet, you’d do well to avoid deep fried peanut butter and banana sandwiches, candied yams and deep fried dill pickles. Bleurgh. 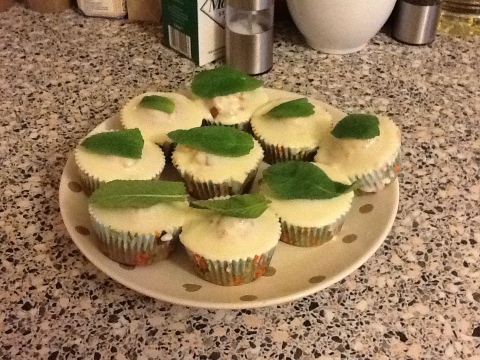 Saying that, the majority of the recipes look very very edible and the effort she puts into presentation is to be commended. 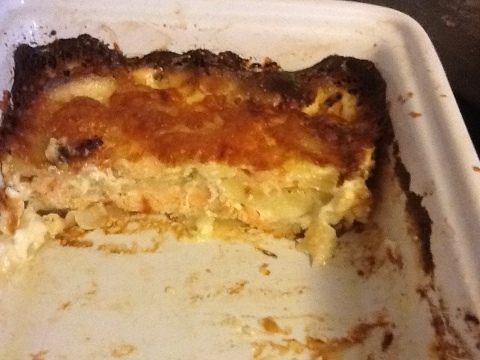 I decided to start off with a pretty tame, unchallenging recipe- gratin dauphinoise with smoked salmon. 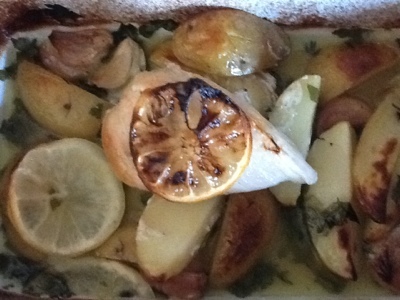 The Boyfriend makes an immense dauphinoise potato dish that cannot be bettered, but as he spent the afternoon at work I thought I’d knock this recipe up as he does love smoked salmon. No, it isn’t as good as his but it is different and worth making as a main meal rather than a side dish. 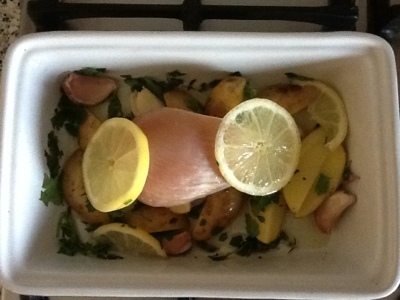 It was very tasty, with a carby hit from the potatoes, richness from the cream and some omega goodness from the fish. Fish purists may recoil, but in the last 15 minutes cooking time I grated some cheese over the gratin and obviously this raised the gratins game (melted cheese has an excellent tendency to do this) and gave it a crunchy, cheesy topping which was delicious. 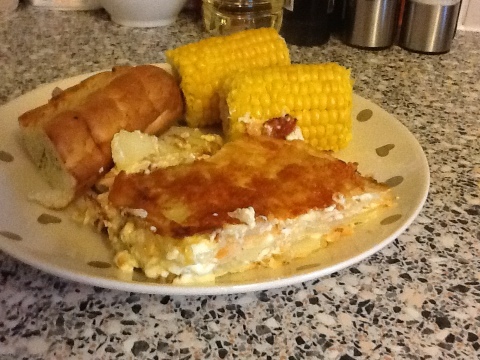 Apparently you shouldn’t mix fish and cheese, but what would you rather eat, gratin with cheese or without? Thought so. Rules were made to be broken so mix things up. Kerstin recommends serving this gratin with a green salad, scattered walnuts and a walnut oil dressing, but that shits not gonna fly with the old ball and chain, so we had corn on the cob and garlic bread instead. He liked it, I liked it, everyone’s happy. I suspect this dish would be even nicer on a cold and dark winters evening. Last night we both did a bit of cooking making homemade pizzas. If you’ve not made pizzas with your other half then you really should try it as it’s a lot of fun. I was in charge of the tomato sauce, he was in charge of the dough. Cue much hilarity from phallic shaped dough and trying to spin the pizza as if we were in the kitchen of an Italian restaurant. But he did make a better dough than I ever could, he may just have the makings of a master baker in him! Chuck your selection of toppings on it (I went for onion, pepper, peppadew peppers and chicken) and plenty of cheese,chuck in the oven for 10 minutes and voila, delicious homemade pizzas! Just don’t put too much cheese on top otherwise you’ll end up with pizza slices that can’t take the pressure and collapse. He learnt that the hard way. I highly recommend making pizzas with someone, it’s quite a bit to do alone and definitely not as much fun as when you’re with someone. We used a recipe from Rachel Allens ‘Home Cooking’ cookbook, but there are so many different recipes online so the possibilities for tasty pizza are endless.